The National-Dobro/Regal connection story is fairly well known in vintage guitar circles, but it's worth repeating. In the early 30s, the California-made National-Dobro resonator guitars were selling like hot cakes, so the Regal factory, in Chicago, was contracted to build the wood body, and install the metal parts shipped from California. In 1936, all California assembly had moved to Chicago. Additionally, it's well known that Regal built many resonator guitars without the Dobro or Regal name. These guitars were distributed through jobbers, and were ultimately sold through stores or catalogs, such as Sears and Montgomery Wards. 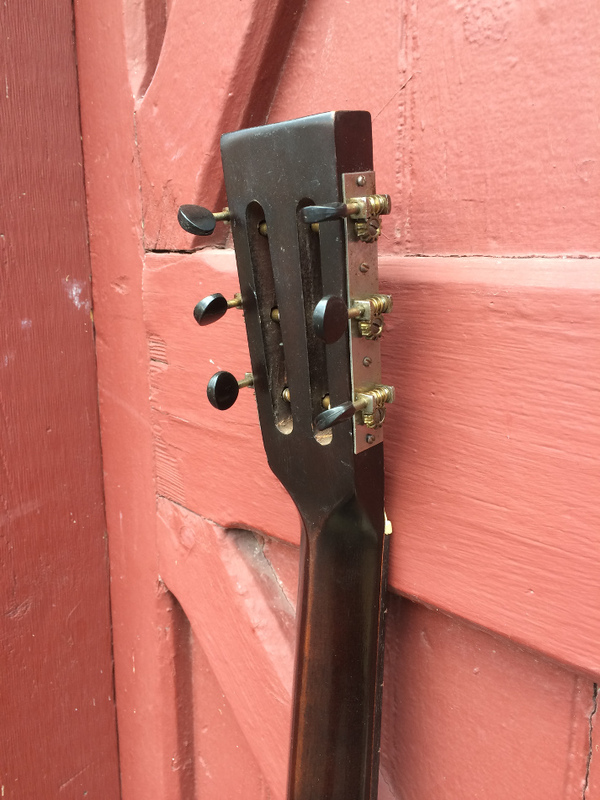 This guitar is one such catalog guitar, and likely made right before WWII shut down production of the metal parts due to the war effort. It's difficult to date, since the off-brand instruments rarely had serial numbers, but we'd guess c. 1939 would be fairly accurate. The body is ply, which was used in all wood-bodied Dobros and Nationals we've seen. The top has two 'f'-holes, and is bound in white paint. Both top and back sport an attractive sunburst. Inside, there is an aluminum, stamped cone, but no through-neck stick, spider or soundwell, as typically found on labeled Dobros and Regals. Instead, a metal bar stretches across the opening and the bridge and cone anchor to this. The saddle is fret wire. This is a cheaper approach than the cast aluminum spider, and makes sense considering it's a catalog guitar, the depression, looming world war, and the end of production just on the horizon. The neck is basswood or poplar and is carved in a pronounced 'V' typical of the period for Regal. The neck is attached with a traditional dove tail, much like some of the National wood-body guitars. The original fret board was 'ebonized' maple, but it essentially splintered when frets were removed. The replacement board is ebony, non-radiused like the original, with new frets. The original pearl position dots are retained. A nice touch is the seldom seen 'Moon & Stars' cover plate. 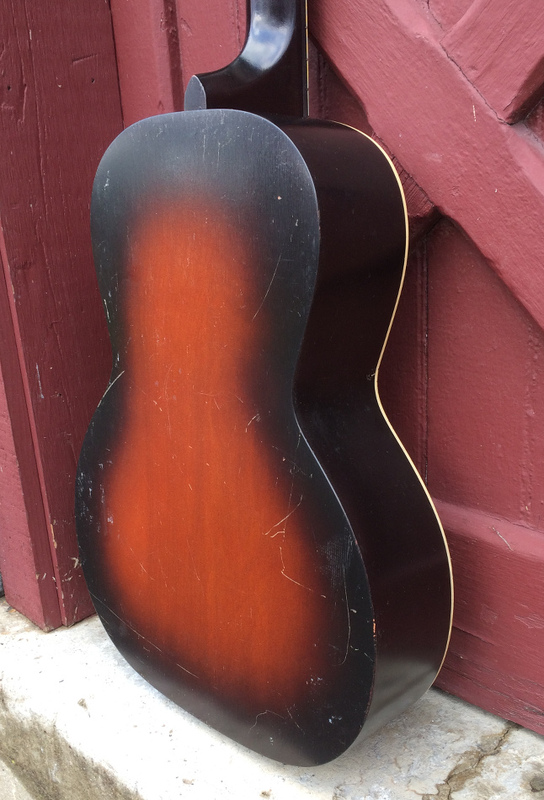 This design appeared around the mid to late-thirties on some mandolins, but it's pretty rare on guitars. The scale length is 25 1/8". The neck measures 1 13/16" across at the nut and string spacing is ~ 2 1/4" across at the saddle. There are no apparent repairs or signs of abuse on this guitar; it still has its sparkle. The tuners, nut, tail piece and end pin are all original. There is some oxidation to the cover plate, and a few nicks and scratches from age and use. The neck is straight, and with the fresh neck set and new fingerboard and frets, the guitar plays easily. Action is set at 6/64". The guitar has the Dobro voice, but likely due to the non-spider set up, is not as nasal sounding as most wood Dobros. But it projects well, with a nice woody ring. A really nice ragtime or blues slide guitar. Comes with a soft case. Be sure to check the sound clip!